Partnering with SUSE enables vendors to build and deliver solutions that help their customers reduce costs, manage complexity and mitigate risk. 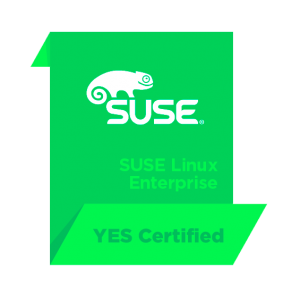 The SUSE YES Certification program brings this assurance by providing easily identifiable products that are certified compatible with SUSE technologies. This lets end- users know that both SUSE and participating SUSE partners will work together to support them when deploying certified solutions in a SUSE environment. Hewlett Packard Enterprise (HPE) has been partnering with SUSE for more than 25 years, participating in joint engineering, reference architectures, innovation, YES Certification, and joint efforts like the HPE Catalyst UK program. The HPE Catalyst UK program brings HPE, Arm, SUSE, and three leading UK universities together to establish one of the largest Arm-based supercomputer deployments in the world with the goal of advancing the digitization of the UK economy. The three supercomputer clusters delivered by the Catalyst UK program will use over 12,000 Cavium ThunderX2 Arm processors hosted by HPE Apollo 70 systems running SUSE Linux Enterprise Server 12 for High Performance Computing (SLES 12 for HPC), and due to the vast amounts of data that will be generated from physical world simulations, the solution also includes SUSE Enterprise Storage. With the high level of cooperation between HPE and SUSE, it is no surprise that the HPE Apollo 70 System is the first Arm® processor-based system to pass SUSE YES Certification. HPE Apollo 70 System is designed for Linux workloads, specifically HPC clusters, and features the high performance Cavium ThunderX2TM processor with up to 32 cores and 8 DDR4 memory channels. This high core count and memory bandwidth makes the HPE Apollo 70 ideal for memory intensive HPC workloads. It leverages the Apollo z70 8 LFF chassis, which can house up to 4 Apollo 70 system modules. The SUSE Linux Enterprise platform complements HPE hardware innovation, and together they deliver increased application performance, system reliability, and management efficiency for the most demanding HPC environments. The HPE Insight Cluster Management Utility allows customers to provision, monitor, and manage HPE Apollo 70 System clusters from tens to thousands of nodes with a flexible and efficient interface and because the Apollo 70 is SUSE YES Certified, users can be confident that their deployment will be backed by two industry leaders in SUSE and HPE.